Usually it changes depending on what look he's going for that night. Last night he was going all out - smokey eyes, 1950's hair and outfit to match. He picked up Urban Decay tinted moisturizer months ago in House of Fraser. Before that he had a waterbased foundation from MakeUp Forever. Really all he's looking for is something to even out skin tone. Working in a bar, there are often event photographers there or customers looking for a photo with him. I bought him the Bourjois Intense shadow as part of a present. It's the blackest eyeshadow I have found, besides Urban Decay. It has great staying power, especially when used wet. I also got him the Rimmer Waterproof eyeliner, which he really liked because it lasted all night and didn't smudge. This is his second pencil since January! During the week he'll wear this by itself. He has the professional brush roll from ELF, he picked it up ages ago ... I can't really remember why, but at least he's not using mine! 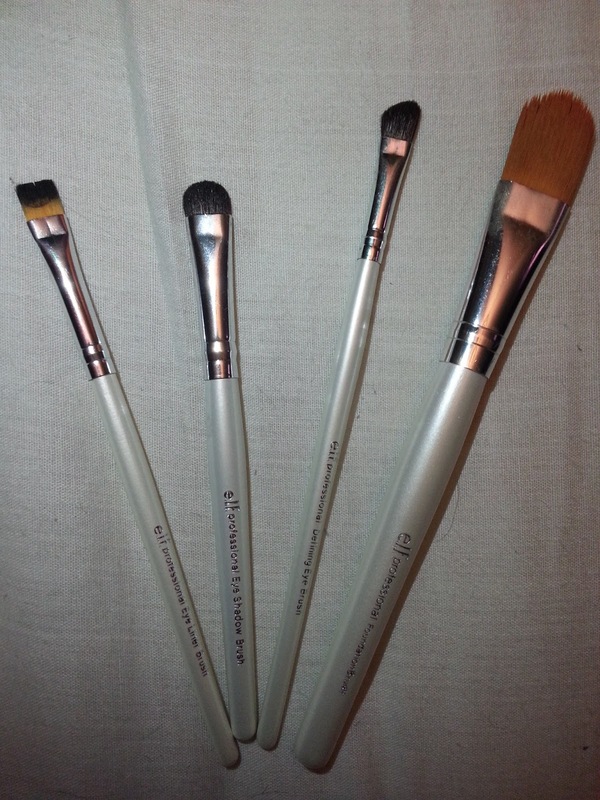 These are the brushes I use for his makeup. The foundation brush for the tinted moisturiser, the eyeliner brush - dipped in water, to line the eyes and set out the general shape and to create the darkest shade, closest to the eye. 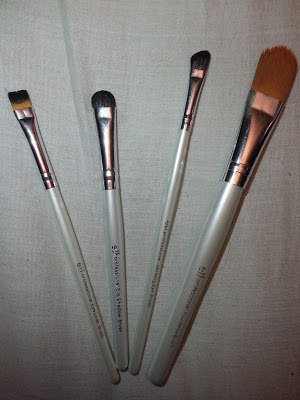 I use the domed eyeshadow brush with dry eyeshadow to add more depth and smokyness and give the final brush, the eye defining brush, something to blend. I blend into the crease and sometimes part of the way on to the brow bone. I'm conscious of the fact that I don't want it to look too done, so I make sure to do a lot of blending. Last night we were particularly happy with the finished look. Sure it's something we've done hundreds of times before, but I've been trying to see if it was possible to do a manly wing - what I've learned is that it involves a lot of blending. As you can see his eyes are incredibly blue. Very pale in real life. He started wearing black eyeliner years ago to define them - and I think it works. Well, of course I think it does! 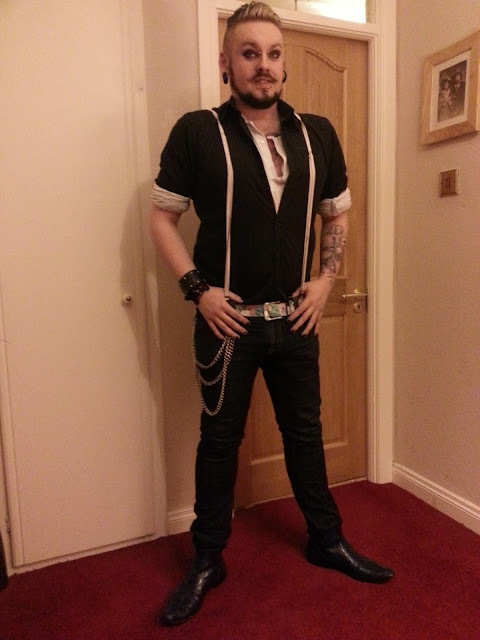 Quick phone snap to give you an idea of the overall outfit. Partially because I wanted to show how the whole look tied together (although I can't take much credit, I was just following instruction) - also if there are any guys out there looking to try something adventurous, hopefully this will act as some inspiration. The shoes are Aldo is anyone is wondering - their mens shoes are amazing, such a welcome change to white trainers. Seriously, white trainers need to go away for a long while. So who said makeup can't be manly? Do you know anyone partial to their guyliner? Brilliant post! Definitely haven't seen any posts like it. You did a great job too! Haha, thanks! Don't think I could go too far wrong with tinted moisturiser and loads of black eyeshadow! Aww look at him all dressed up!! I really like the smokey eye! haha get your mind out of the gutter!! Brilliant post Lisa, I really enjoyed it. 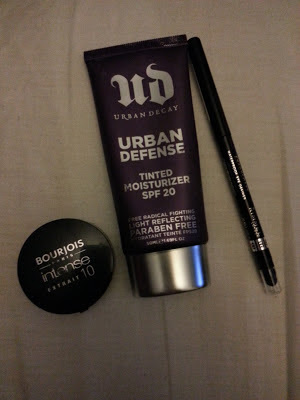 I wouldn't mind trying the UD tinted moisturiser either! I had to tell myself that more than anything else! Thanks :) I think he might be popping up more often on the blog because he makes for interesting subject matter! Aw yay thanks! :) It's really proving popular! He's come home with funny stories of customers noticing his eyes and asking about his eyeshadow!!! Haha - thanks. 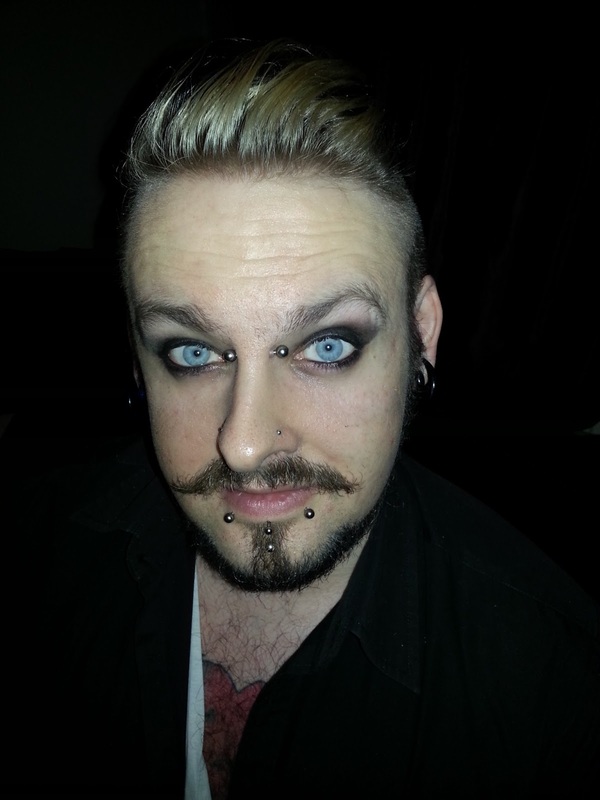 I think this is proof that more men should wear eyeliner! It's proving very popular indeed! I want to see pictures of the eight inch mohawk!! Haha, I'll get him to do a hair story!! !